Participant : Director Kyungjae Myung (IBS Center for Genomic Integrity), Prof. Yonghwan Kim (Sookmyung Women's Univ. ), Geert Kops (Univ. of Medical Center Utrecht), Prof. Wei Xiao (Univ. of Sask. ), Prof. Anindya Dutta (Univ. of Virginia), Prof. Deong Su Hwang (Seoul National Univ. ), and associates. 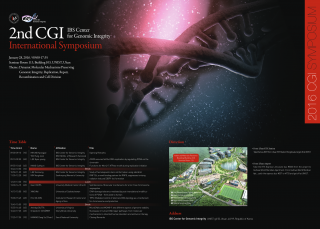 The 2nd IBS International Symposium on Genomic Integrity will be held at UNIST on January 28th, 2015. The theme of the symposium is “Dynamic Molecular Mechanisms Preserving Genomic Integrity: Replication, Repair, Recombination, and Cell Division“.